Note: this is step 2 of a print / sinter / polish process. 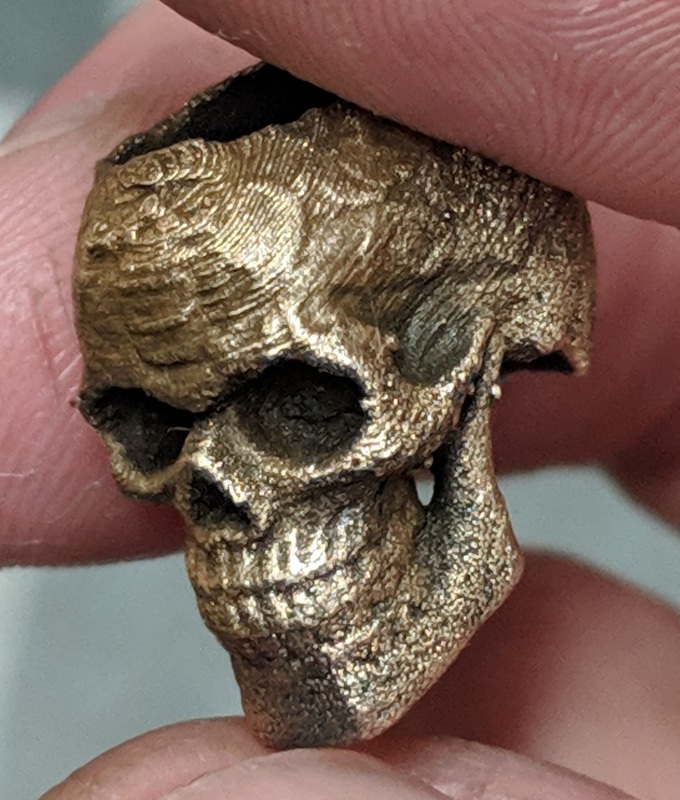 I've spent sort a lot of time figuring out how to print and polish metals. Just because it's neat. There was a LOT of trial and error, and very little actual material I could find reliably, so I hope this log helps any others (or future me) reproduce the results. ProtoPasta has the best (sturdiest) material, but ColorFab's stuff polishes better. These will be softer than PLA but sturdy enough for decorative use. Coconut charcoal: ~1" in the bottom of a cup, then cover the part with 1-2" of coconut (cf: Hadar's instructions). Sinter at 1580* for at least 4h for small parts (<5mm at the thickest/widest) Longer hold time will consume more coconut, so use a taller vessel / more nut. Allow to cool in place / slowly. Once it's well under 700F you should be able to remove it from the coconut. ColorFab BrassFill, BronzeFill, CopperFill print very well, but they'll always be about half plastic. Less strong than PLA, but they do polish nicely and they can be tarnished / patina'd easily. Sand with light sandpaper (like 220+), polish up to 400-600, then use a jewelry polishing cloth to buff & shine. Brasso works best if you want a verdigris patina. If you get it hot (like with vigorous sanding) it will get smooshy almost like clay; layer lines can be smoothed without removing a lot of material. These can't be sintered -- not enough metal. I tried, it leaves a weird-looking metal matrix with holes where the PLA burned out. VirtualFoundry's Filamet is challenging to print (read more below) and, being mostly metal, isn't very strong when left alone. It can be finished similar to the ColorFab material. This material is designed to be debound (PLA burned out) and sintered. Proto-Pasta has HTPLA with Copper, Steel, and Iron. They are fairly strong, but have less embedded metal. They don't "smoosh" like the others. Not as strong as PLA, but when un-sintered is the strongest of the metal-like materials. The steel will buff out pretty well (again, similar process as above). The iron can be rusted -- brush off a surface layer with a brass brush, then soak it in hydrogen peroxide. It won't take very long to turn it red and heavily textured. A coat of clear rustoleum over the rust will preserve the texture, and darken the color to a dark brown (with a little hint of red). The rest of this article focuses on sintering Filamet into solid bronze. Paragon SC2 for a sintering kiln. It fits on a tabletop, the exterior gets hot but not "will set my house on fire" hot. it's a "muffle" type kiln. I have no idea whether the thing is calibrated on delivery, so look to calibrate it below. I use a shelf kit inside the kiln: 4 small risers and a ceramic plate. Stainless steel cups for vessels. I use 4 oz sauce cups, they're a fair size for very small parts. At 6h they *just* hold enough carbon. I may use larger cups. Each cup seems to survive more than 10 firings, probably a lot more with limited quenching. The cup needs to be TALL rather than WIDE; the sides will prevent oxygen intrusion, but the top is where the coconut gets burned off... Lids seem to be a bad idea; for identical program, part, and charcoal fill, a lidded vessel produces a brittle part with no shrinkage. I suspect the binder is unable to burn out completely. Is a dark art. Virtual Foundry recommends their "magic black powder," which I think is calcium sulfate and activated charcoal. Make a thin slurry of it, brush it onto your part to make sure you hit all the surfaces, then drop the part into the slurry and bake it. The MBP dries into a matrix (basically a half-carbon plaster) to support the part for debinding and sintering. During the quench the MBP fractures and dissolves into water. The Calcium Sulfate smells an awful lot like sulfur while burning off. You will notice. You won't have to evacuate the garage or anything. ra1: full / f1: 350 / h1: 1.15 # "candling"
ra2: 150 / f2: 500 / h2: 1.30 # "debinding #1"
ra3: full / f3: 700 / h3: 1.30 # "debinding #2"
ra4: full / f4: 1530 / h4: 0.45 # "sintering"
Immediately after h4, submerge the vessel (and therefore part) in water for a fast quench. It will stop bubbling in 10-15 seconds, and will be cool to the touch shortly thereafter. h4 is meant to be adjusted based on your part. In my experience, parts do not sinter fully with this program. I haven't figured out the symptoms of "over-sintering" a part. I am working with Virtual Foundry on the process, but no progress yet. So far I've only gotten something like "the material changed and we're figuring out a new process." ra2: full / f4: 1590 / h4: 4.00 # "sintering"
Note that the sintering program will vary depending on the size of the part, the type of refractory, phase of moon, etc. This works for bead- or coin-sized parts. Coconut charcoal, with about 0.75" on the bottom, then the part, then cover the top flush with the cup. Run the program and let it cool to below 600F. The coconut seems to retain heat well, and will be smoldering when it comes out. The top layer will be ash, and this can be gently blown out if you want to retain the darker carbon underneath. At longer soak time (like 6+h) the coconut will be completely consumed -- a deeper vessel (more coconut) can help here. More coconut is generally better; it seems to help insulate the part and distribute heat evenly, leading to a more even sintering process and consistent shrinking (and therefore less cracking). If the MBP isn't deep enough it can crack, letting oxygen into the part. I'm not 100% sure of this symptom. I ran some test parts in the open they came out very dark grey and brittle throughout. NB I haven't had repeatable success with MBP. If the part doesn't get hot enough / long enough, the interior (or part of the exterior) may not sinter. The affected material will be de-bound bronze powder, and will brush off. Generally brown or reddish-brown. Over-temp will melt the bronze and the part may deform significantly -- surface beading, for instance. At very-near-overtemp the part will deform and may take teh shape of the support material: lumpy with coarse carbon, or "sandblasted" with powdered carbon. The interior of the part seems to need SIGNIFICANT time to heat. Even at 6h soak time, the solid material seems only about 2-3mm deep (coming form both sides), so a section thicker than 5mm seems to want a lot of time to soak. Over-heated parts can melt, deforming the part significantly. I've observed surface beading, where I believe material melted and pooled in small areas. Under-timed parts will have de-bound powder in the center. The sintered exterior layer may be VERY THIN, like 0.01mm (think bronze foil). This is hard to spot immediately, as the bronze can be strong and will hold up to a wire brush. Oxygen intrusion will result in a very dark grey part (but basically impossible to distinguish from the surface later created under MBP). You want the part to shrink. If Filamet is truly 90% metal, I would expect the part to shrink at least 10%. I've observed substantial shrinking between 30, 45, and 240 minutes dwell time, with diminishing results at 360 minutes. Under-shrinkage == under-sintering. My current shrink-target is 20%: if it shrinks less than 20% (like, 10%) then I believe the interior is not correctly fused/sintered. The first spools I got were wound pretty tight, and I had only one successful print (which used about 18cm of material). The rest broke in the feeder tube. The newer spools are much looser (larger radius) and I have far more success, nearing 100%. There is some inconsistency in material thickness across the spool, be prepared to fine-tune flow rates during a larger print. Mounting: put the filamet above your printer hanging straight down if possible, and minimize bending to the extruder. I use a wider guide tube and a custom mount above my extruder. Bed: glass bed at 50F. This stuff sticks HARD at temp, but will pop up when cool. Make sure the glass is very, very clean. Scrape off any glue or residue, clean it, then clean it again with water. Seriously. Very clean. 50F is plenty warm enough, but cool enough that the material can cool quickly while printing. Nozzle: I have lots of success at 0.50 in a hardened steel nozzle, but I wear them out quickly (few kg of various filaments). Buy extras. I don't know whether Filamet is more abrasve than, say CF, but a clean nozzle solves lots of problems. My hardened nozzle costs half as much as a 100g spool of filamet, so I am not shy about changing them early. Heat: as little as you can. Filamet flows well at 210. If you go too high it can debind inside the hot end, and will basically become bronze powder. You don't want this. First layer at 210, subsequent layers at 200. Speed: 30mm/sec or slower. Try not to go TOO SLOW though, the bronze holds heat and it will get a little droopy if you have a layer come across another one too soon. Cooling: yes. Use the fan at full blast. It holds heat, you need to get that heat back out so it'll hold shape.